Please click on the WSJ link above to see more of Monet's paintings. Eyeing a bridge, some people see utility, a way over a barrier. Others see industry, activity, modernity. Still others see a vantage point, with lofty, wide views. And some see beauty, in form and structure. When Claude Monet (1840-1926) looked at Waterloo Bridge, spanning the River Thames in London, he saw something else: potential and opportunity. Intrigued by London's weather, he decided to use Waterloo Bridge to give structure to a series of paintings that would attempt to evoke the city's light, air and atmosphere, especially fog and smog. During the winters of 1899 through 1901, he set up his paints in the Savoy hotel on the river's north bank, and rendered the bridge 41 times (more than either the Houses of Parliament or the Charing Cross Bridge, his two other London series). Refreshingly small—the better to look slowly and to compare—"Monet's Waterloo Bridge: Vision and Process" at the Worcester Art Museum unites nine of those 41 paintings in one gallery. The bridge stretches across each, but its appearance alters in color and context, fades in and out of focus, and in one case—"Waterloo Bridge" (1900-1901) from the Davis Museum at Wellesley College—almost disappears entirely. Unusually, this nearly abstract work shows a brilliant orange sun, surrounded by flecks of violet clouds. Painted in long, striated brushstrokes, it was still in Monet's studio when he died, and is probably unfinished. But it illuminates Monet's process: He would first cover the entire canvas with a base image in thinly applied paint, and then proceed to add and make changes. Besides, it's beautiful. The Davis painting also highlights a noteworthy point of this exhibition, which originated, in slightly different form, at the Memorial Art Gallery of the University of Rochester. Monet is known for painting outdoors—Impressionism, after all, was about capturing the moment. But here he worked on many paintings at once, lining up as many as 15 canvases and moving from one to another as the sun moved across the sky, the air grew sootier as industrial plants cranked up for the day, and the fog lifted or thickened. Then he took them all back with him to Giverny, France. There he continued to work on them "obsessively," as Nancy Norwood, the Rochester museum's curator of European art, writes in the exhibition catalog. These paintings are "rarely as spontaneous and direct as they appear," she adds. 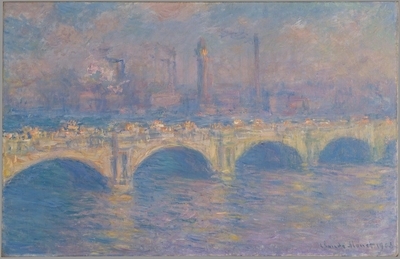 Visitors can see that in "Waterloo Bridge, London, at Dusk" (1904) from the National Gallery of Art. Documents show that Monet painted the bridge only in the morning. 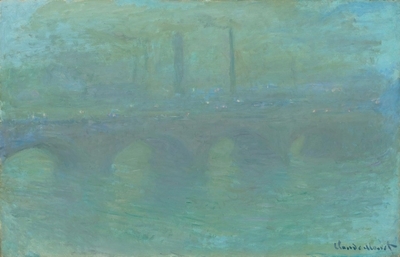 If this hazy all-over turquoise wonder is a nocturne—and the glowing lights on the faint gray bridge suggest that it may be—Monet conjured the evening atmosphere. In two paintings, "Waterloo Bridge, Gray Weather" (1900) and especially "Waterloo Bridge" (1903), the latter from Worcester's collection, the mood is bleaker, the weather heavier. Several boats add to the smoky, industrial feel of the Worcester painting. The other, from the Art Institute of Chicago, feels lighter, with less contrast. Traffic is portrayed in blues and whites, rather than the orange and green in Worcester's work, and just one lone boat peeks through an arch of the bridge. All the other paintings here are brighter in tone. Three feature striking reflections of the sun on the water. "Waterloo Bridge, Sunlight Effect" (1903) from the Denver Art Museum is thick with a shimmering patch of yellow, white and orange that contrasts sharply with boats in the foreground and a smoke-spewing factory behind the bridge. 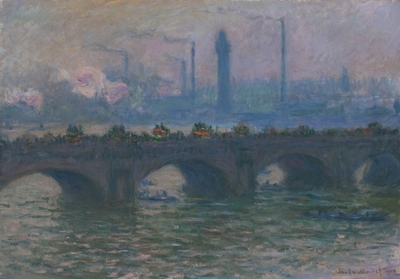 In "Waterloo Bridge, Sunlight Effect" (c. 1900, dated 1903) from the Milwaukee Art Museum, Monet shows more industry in the background, but adds a dramatic sky of pink, blue and purple tones, possibly from air pollution. And "Waterloo Bridge, Sunlight Effect With Smoke" (1903) from the Baltimore Museum of Art is a fainter, softer version of the Denver painting—though industrial London beyond the bridge is barely visible in the haze. Sunnier still is Rochester's "Waterloo Bridge, Veiled Sun" (1903), full of yellows, which hangs next to "Waterloo Bridge, London" (1903) from the Carnegie Museum of Art—the sunniest of all. In it, there's little fog, the sky bears traces of blue, the granite bridge is yellow, and buildings with smokestacks are almost clear in the background. A second gallery here, with three interactives from Rochester, explains how Monet created these paintings, reworking sections as he fused the impressions, experience and, finally, memory of what he saw in London. Remarkably, technical studies suggest that he used as few as five pigments and probably merely up to nine to create these variations (not all of the paintings here have been analyzed, but Monet said he used a limited palette for them). In the exhibition's introductory wall text, Worcester curator Nancy Burns speaks of Monet's paradoxical goal, "to make visible the invisible qualities of the landscape." These nine paintings confirm that he did so, brilliantly, almost magically—corroborating his status as one of the world's best-loved modern artists.